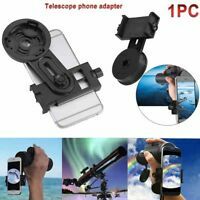 Cell phone holder adapter that actually works as described. It mounted to my telescope lens OK and I found that by putting masking tape on the prongs within the device it grabbed much better. 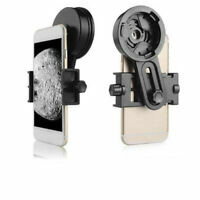 The device works as described and holds the android cell phone I use very well. 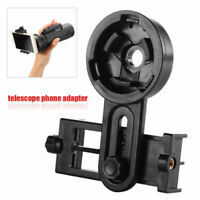 It is best used on a standard telescope or monocular as the cell phone sees the mirror mount on a reflector telescope. This may be an issue with my cell phone camera though. 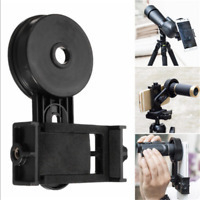 I use the cell phone to bring into focus the astronomical object to be viewed and then remove it to view by eye so it really makes no difference to me. Nice item for the price! I had to modify the part that connects to the scope so that it would fit my scope's eyepiece. For the price, I think it is great! For the price, it works ok. The clamping mechanisms hold and adjust easily.